← Back to the moon! This is Ken Perrott’s response to Paul Connett’s last article Fluoride debate: Arguments against fluoridation thread. Part 5. Paul. Paul’s last article was another Gish gallop of arguments and questions he demands I answer. I discussed the use of the Gish gallop as a tactic for avoidance in my last article. In this article Paul demonstrates how the Gish gallop enables the user to also claim their discussion partner is “ducking” issues and “didn’t address,” “didn’t acknowledge,” “didn’t comment on” or “didn’t respond to” issues he has raised. Again, I will not walk into that debating trap and mechanically go through his 30 numbered arguments but will attempt to accommodate as much as is reasonable with some general comments and some specific replies. This year the fluoridation issue raised questions about the problems of activism for a number of New Zealand scientists. The local scientific community was taken by surprise when the Hamilton City Council in June this year voted to end fluoridation. Surprised because most of us were unaware that the council had decided not to go ahead with a referendum (as we had expected) and instead use a “tribunal” process of consultation. This approach suites activist groups very well. They can be continuously in touch with council decisions, have a membership or contact base that can be organised rapidly and they can saturate such a consultation process with their own submissions. The Fluoride Action Network of NZ (FANNZ) did this very well. They were able to dominate the consultation process with 89% of the total submissions. (This in a city where referenda have shown about 70% support fluoridation). Being part of Paul Connett’s Fluoride Alert Network they did this on an international scale – about 30% of their submissions were from outside Hamilton with many from outside New Zealand. People like Paul Connett and Declan Waugh made video submissions. These people were promoted as “international experts” or “world experts” on the subject even though they have no credible scientific publications on the subject. Of course local councillors did not have the background to see through that ruse. Reports prepared by the council staff showed the number and international origins of these submissions impressed the council and it’s bureaucracy. It was easy to conclude that what local scientists lacked was a similar organised activist group. If not specifically devoted to defending the science behind fluoridation then at least to defending science in general. After all, anti-fluoridation activity is not the only area where science gets challenged. Scientists and health professionals did become active in social communication activity, Facebook, letters to the editor, etc., but I noticed a distinct lack of enthusiasm for any organised activism. No one rushed to form an activist group. Scientists have a problem with activism because the group thinking and selective use of scientific information inevitably involved is in direct conflict with the scientific ethos. That is why activist scientists tend to face disapproval from colleagues, although this has changed a little recently where the vicious personal attacks on individual climate scientists has made some form of scientific activism essential. Contrary to what many people believe humans are not naturally a rational species. Despite their intelligence and ability to reason they are in practice driven primarily by instinct and emotions. In fact, they would have long become extinct if they relied completely and in all cases on the inefficient and slow process of rationally considering every event that required a response. This means that confirmation bias and cherry picking information come naturally to us. It is normal to seek information which supports the preconceived ideas and theories we are emotionally attached to. Scientists are just as prone to these human failings as others but the scientific processes help reduce this problem. Scientific ideas and hypotheses are tested by experiential evidence – they are compared against the real world. Theories are judged on their evidential support and not their attractiveness. (This does not deny an important role for speculation). Ideas and theories are exposed to harsh critical consideration by colleagues. All this helps to encourage objectively and reliability of scientific information – while not denying that there are still inevitable residual problems from confirmation bias. The dynamic nature of science and the provisional nature of current theories and ideas, means that over time mistakes arising from these human frailties can be reduced. Contrast that with the position of activists, even scientific activists. They are inevitably driven by strong ideological or political aims which naturally encourage confirmation bias and cherry picking. But unlike a scientific researcher they exist in an uncritical, or at least biased, social environment. Group thinking encourages a selective approach to scientific knowledge and a resistance to considering anything conflicting with the activist agenda. While heretics can be encouraged in scientific research they get jumped on in activist groups. Ideas and messages do not get tested against reality – far from it. They are tested for political effectiveness, in the political arena – not the natural world. In effect, the world of activism is stifling for a person used to the creativity of genuine scientific research. I recognise that at times activism is essential and have myself played an activist role in my past. Now I see it as a necessary evil but not something I could do as a job. I do not envy Paul Connett his job as an executive for an activist organisation. The environment of group thinking and the need to abandon intellectual honesty to the ideological aims of the group are bad enough. But what happens to a scientist in such a position who finds they can longer follow the “party line?” That they no longer “have the faith?” It is a bit like the priest who finds, after years in the job ,they are an atheist. Do they go on hypocritically preaching every Sunday or do they take the honest way out and abandon their job with it’s financial and social security to face an uncertian future? In scientific research it is expected that we can change our beliefs and ideas in the face of new evidence. Not to do so could lead to loss of scientific prestige and employability. It is the reverse to what Paul would face if he lost his anti-fluoridation convictions. That is the problem for me – the strong pressure to conform to the activist ideological agenda despite the evidence. I think that colours Paul’s approach to many of the issues in his articles here. It is interesting Paul devotes so much time on this brochure in his last contribution to what, after all, is meant to be a scientific exchange, not an exercise in laying guilt for someone else’s transgression. No one is actually defending the Queensland Health brochure – even Queensland Health! At this stage it seems purely to be a plaything of the anti-fluoridation groups. Paul himself was unable to supply a source or citation yet he had ready access to it and promotes it far and wide. Don’t know what else I can add – except writing personally to Queensland Health with a complaint. Bit difficult without a citation to its use I could quote. Never mind, my public admonishment here should suffice. I agree with Paul that we should expect better from our public servants but Paul missed my point “This sort of misrepresentation is probably more common among opponents of fluoridation.” I certainly find misrepresentation by public officials on this subject rare – anti-fluoride activists make this charge far more often than is justified. I do not buy Paul’s argument that similar but much more common misinformative propaganda by anti-fluoridation activists is somehow more permissible than the rare piece by a public servant. Especially as we have the power to correct a public servant, submit a freedom of information application, get a retraction and an apology. But try that with anti-fluoride activists and organisations like FAN and FANNZ. No such luck. One is more likely to be abused. Paul’s complaints in this area would be a bit more convincing if he publicly condemned the misleading propaganda from his own activists. He cannot be unaware of the extreme claims made by members of his Fluoride Alert Network throughout the world. Quite apart from their misrepresentation of the science, which he probably encourages anyway, there are the political and personal harassment of people by sections of his activist network which he cannot be blind to, yet refuses to condemn. I have yet to see him condemn the atrocious propaganda, lies and personal attacks of propagandists like Alex Jones and Vinny Eastwood. It is not enough to say he doesn’t necessarily support all their positions. The fact that he uses their services, and they use his, makes such weak dissociation disingenuous. Why is he unwilling to publicly condemn such behaviour? I don’t think such vague charges should be the subject of our scientific exchange – especially as they divert attention from the scientific issues involved in planning and interpreting such trials and epidemiological studies. Paul should have looked at the disputes around Colqhoun’s analysis of the New Zealand data. 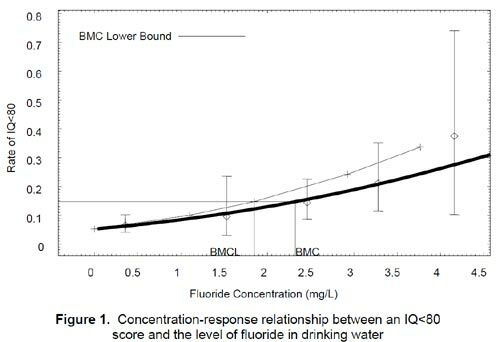 Colqhoun was strongly criticised for reliance on questionable data, crude measurements of caries prevalence and failing to establish residence histories and therefore reliable measures of fluoride intake (see, fir example, Newbrun & Horowitz, 2002). He also placed far more reliance on longitudinal studies than is warranted and was selective in choosing studies which have compared fluoridated and unfluoridated communities. I looked at the current NZ data, which are similar to that analysed by Colqhoun, in my article Cherry picking fluoridation data. This illustrates a number of things. The national data shows clear differences between children from fluoridated and unfluoridated communities and an ethnic effect attributed to social and economic deprivation. This is just normal school clinic data, without technique standardisation for those making the measurements or proper recording of place of residence. The latter effect probably shows up more strongly after 2004 when a “hub and spoke” dental clinics system was introduced further confusing proper records of likely fluoride intake because one clinic could serve a number of areas – both fluoridated and non-fluoridated. This is a likely explanation for the apparent decline of the effectiveness of fluoridation after 2006. To illustrate how easy it is to extract data for regions and cities which give meaningless results the plot below shows the data for the Waikato. Clearly the variability in this data, (indicated by abrupt changes year to year) is so large it make interpretation meaningless. Yet this does not stop FANNZ, the local version of Paul’s activist organisation, from hypocritically using just the 2011 data for the Waikato (where by chance children from fluoridated areas show more caries than unfluoridated!). One of their representative end used my graph below, showing the problem of cherry picking, as “proof” for claiming fluoridation increases incidence if caries. During the recent referendum campaigns this misrepresentation by anti-fluoridation activists was rife – yet they consistently ignored or covered up the national data. There is a lesson in this. Careful and critical analysis of epidemiological data is necessary when considering such data. Effects of technique standardisation and changes, places of residence, mobility of families and diffusion of products from fluoridated into non-fluoridated areas must be considered. Too often anti-fluoride activists simply select the data that fits their story better. They may even be unaware of what they are doing because confirmation bias is a trap we can all fall into and it can be very tempting if one is simply looking for plots to illustrate an effect. To be fair, I have even seen proponents of fluoridation fall into this trap occasionally. Paul mentions margin of safety a lot. He claims that I did not comment on the margin of safety analysis he provided based on the Xiang et al. (2003a,b) study. Has he not been reading my side of the exchange? Briefly my question related to the figure used by Xiang et al. This is just another example Paul’s selective use of the literature and selective interpretation of parts of it to justify a preconceived claim he wishes to make. In practice, safety limits and margins of safety must be based on a far more extensive review of the literature and involve far less hand waving than Paul demonstrates in this case. Several times Paul has raised the issue of bottle-fed infants without describing the problem. Broadly, he is making the common anti-fluoridation claim that the reliance of bottle-fed infants on formula made up with fluoridated water causes normal limits for maximum F intake to be exceeded. Usually activists using this argument will refer to health authorities which they claim recommend that formula not be made up using fluoridated water. They are conceding that in some cases, some of the time, recommended upper levels for fluoride intake can be exceeded for fully formula fed infants. However they do not see this as a real safety concern. These conclusions lie behind the current advice from our Ministry of Health on this subject. This takes account of the need for review of current ULs and considers use of fluoridated water safe for fully formula-fed infants. However, they also recommend that if parents are concerned (such as over the risk of dental fluorosis) they should use non-fluoridated water for part of the feeding – a peace of mind matter. can use powdered or liquid concentrate formula mixed with water that either is fluoride-free or has low concentrations of fluoride. Yes, you can use fluoridated water for preparing infant formula. However, if your child is exclusively consuming infant formula reconstituted with fluoridated water, there may be an increased chance for mild dental fluorosis. To lessen this chance, parents can use low-fluoride bottled water some of the time to mix infant formula; these bottled waters are labeled as de-ionized, purified, demineralized, or distilled. This sort of information is often distorted by anti-fluoridation activist propaganda. Very often they claim that authorities like the CDC are recommending as an absolute that parents use non-fluoridated water in preparing formula for infants, and not treat the issue as a peace of mind matter. Anti-fluoridation activists almost unanimously quote figures for total dental fluorosis (or its equivalent) lumping together everything from questionable to severe. This gives them a nice high figure to promote. But, as I have said before, they use a bait and switch tactic to exaggerate the seriousness of the problem by then considering only the more severe category’s when considering the harm. It is worth actually listening to the anecdotal evidence of practicing dentists on this specific issue. How often do they see fluorosis or similar blemishes which need treatment? And how does this figure compare with the frequency with which they see dental decay serious enough to need treatment? I can think of only one dentist who claims fluorosis is a problem which he often sees and treats – he is an active propagandist for FANNZ. I have caught him telling many porkies about fluoridation and I wouldn’t trust his claims. This is not a denial of an increase in mild forms of fluorosis as a result of fluoridation. Nor is if a denial that the relatively small difference may reflect the diffusion of the benefits of fluoridation into the non-fluoridated areas through family mobility, poor representation of residence history and the movement of products prepared with fluoridated water. Paul’s misrepresentation is not the sort of behaviour I expect from a discussion partner in a scientific exchange. All Paul’s manipulation of figures and his claimed access to the minds and “potential psychological problems for young teenagers” does nothing to change the basic situation. This is that water fluoridation can cause an increase in the mildest classification of dental fluorosis but is generally not thought responsible for the more severe classifications. The later are relatively rare and any increases over recent years is unusually attributed to the wider use of fluoridated toothpaste and fluoride dental office treatments (and their accidental ingestion). The common anti-fluoridation propaganda gives the impression that the total fluoridation occurrence quoted is all severe and not almost all very mild or questionable. For example, in New Zealand activists often use the figure of 44% occurrence of dental fluorosis when only 2.5% is of any concern. I have said again and again that one should attempt to understand the scientific literature intelligently and critically. Hard to do as we all suffer from conformation bias and can’t help being selective. Fortunately working within a scientific community there is pressure from peers who will challenge ones interpretation. This helps encourage objectivity and honesty. But working in an activist group one does not experience such challenges. If anything there is the challenge to conform with the group thought. Confirmation bias and cherry picking gets encouraged and rewarded. Paul’s activism and bias is very clear in the way he selectively quotes the NRC (2006) report. Just a few examples from his last article in his attempt to justify conclusions he wishes to draw from animal studies using high fluoride concentrations. “Dunipace et al. (1995) concluded that rats require about five times greater water concentrations than humans to reach the same plasma concentration. That factor appears uncertain, in part because the ratio can change with age or length of exposure. In addition, this approach compares water concentrations, not dose. Plasma levels can also vary considerably both between people and in the same person over time (Ekstrand 1978).” (My emphasis of the bits Paul omitted). I have had to repeatedly battle out this argument with anti-fluoridation activists who obviously don’t understand basic chemistry but I find this statement amazing for a chemist who should understand the concept of solubility products and the nature of ions in solution. Contrary to Paul’s suggestion the relationship observed between natural Ca and F concentrations in groundwaters is usually inverse – F concentrations increase as Ca concentrations decrease and vice versa (see for example Handa 1975 – Geochemistry and Genesis of Fluoride-Containing Ground Waters in India). Just what we expect when a solid phase like fluorite or apatite is determining solution concentrations at equilibrium. “Point 20 ) Classic example of pseudoscience. Let’s assume that Paul is correct in asserting that the presence of Ca2+ ions affects F- uptake in the GI tract. Municipal water supplies in NZ have a target hardness (combined concentration of Ca2+ and Mg2+ ions) of 200 mg L-1. Most of this is Ca2+ as Lime (CaO) is typically used to increase pH in one of the final stages of water treatment. If water was fluoridated to 0.8 mg L-1 F- (unreasonably assuming there is 0 mg L-1 F- to start with) using CaF2 as a source, the concentration of Ca2+ would increase by 0.2 % as compared to using HFA or NaF as a source of F-. This 0.2% change in Ca2+ concentration will not have any appreciable effect on F- uptake in the GI tract. I agree. Sure, the Ca concentration in community water supplies will generally be lower than the target value (which is a maximum) but the principle remains. Replacement of fluorosilicic acid by fluorite (CaF2) as a fluoridating agent would have a minuscule effect on calcium concentrations because there is plenty of calcium from other sources – even is soft water. Paul’s claim is the sort of thing that even an educated chemist might say if they are ideologically driven. This is the problem with activist groups with their own ideological demands and group thinking. It is easy for even the trained person to fall in to an opportunist use of their speciality. And if, like Paul, they are working as an executive of an activist group they don’t have anyone around them to challenge such distortions. I am pleased Paul admits to being “hasty” in his dismissal of the Irish data. But there are two issues. 1: His problem was more than haste – I was objecting to his attempt to belittle the data by suggesting the Irish workers were biased. I expressed surprise that he would reject the data with that suggestion in a scientific exchange. 2: He appears confused – despite my clear explanation of the data I used. These was the same as used by Cheng et al (2007) – for just one country (Ireland) but separated into the fluoridated and unflouridated areas – not just using the average that Cheng et al used). Paul describes the data as “comparing tooth decay in the Republic of Ireland and Northern Ireland.” Clearly it did not. Perhaps Paul’s fixation with Declan Waugh’s discredited comparisons of the health statistics for the two countries was pro-occupying Paul’s mind – or perhaps he wanted to divert the discussion into that area. I repeat the comparison I used below. The dotted line in the RH figure is effectively what Cheng et al (2007) used for Ireland in the LH figure. However, as Paul raises the issue again it is worth commenting again on the flippant way he and other anti-fluoridation propagandists use inter-country comparisons like this. This is the hand-waving involved in claiming the data shows no effect of different fluoridation policies. I will use a figure from Paul’s book to illustrate the problem. Paul claims his figure shows no difference between the countries – but did he do anything to check that? Did he actually measure the slopes for the different countries? Or did he just wave his hands and say there is clearly no difference? Fortunately with so few countries it is relatively easy to compare the slopes. I have done so using the data from the WHO site and found the average decline was 0.17 DMFT/year for fluoridated countries and 0.13 DMFT/year for the non-fluoridated countries. This suggests the decline of DMFT in the fluoridated countries was about 25% greater than in the non-fluoridated countries. Local anti-fluoridation activists reacted strongly to my analysis claiming it is obvious that the analysis is useless. I am sure Paul will point out that the figure of 25% will not be statistically significant – and I agree. The scatter in the rates of decline among the different countries is very large. On top of that the original data itself is hardly very good with generally only 2 data points for each country. But if the variation is great enough to make a 25% difference in slopes non-significant then what value do such figures have for Paul’s argument? Using simple hand waving and eye-balling to claim no difference is deceptive because he hides that variation. We just don’t expect such comparisons to show the differences due to fluoridation policies. Variation and the influence of confounding factors have too great an influence. I have answered that question several times but Paul continues to ignore my response. He claims my description of the normal and natural role of fluoride in bioapatites do not get is anywhere. He ignores my reference to scientific reports of the participation of ingested fluoride in improving oral health, especially through its beneficial role before teeth erupt. Unfortunately Paul cannot get past his emotive description of a social health policy as “forcing” something on people. His naive assertion that normal consumption of water should be replaced by “swishing and spitting out” or by a mouthwash or toothpaste also shows he just does not understand the nature of a social health policy. I discussed this in more detail in my last article. He defends himself by attempting a diversion into USGS data showing 94% of fluoroslicic acid produced as a byproduct by phosphate manufacturers goes to water fluoridation systems. Miller’s 75% of byproduct fluorosilicic acid sold for water fluoridation is lower that the 94% Hirzy quotes but the difference could result from some of the material being converted to other products before sale. So, if a quarter of byproduct fluorosilicic acid, or its conversion products, find markets other than water fluoridation what is it about this quarter which makes it a valuable, saleable product – while the 75% sold for water fluoridation must be classified as a waste product and need a conspiracy for its disposal? As mentioned above there is certainly a market for fluorosilicic acid,and it’s conversion products, apart from use as a water fluoridation agent. I believe that market will probably increase further because the decline in fluorite sources will increase the use of phosphate ores as a source of fluorine chemicals. This will mean that fluorosilicic acid will become more commonly used as an intermediate in the preparation of many, if not most, fluoride chemicals produced. Currently fluorosilicic acid can be used in the tanning of animal hides and skins, oil well acidifying, electroplating, glass etching, as a commercial laundry sour, sterilising agent, in cement and wood preservatives, in the manufacture of ceramics, glasses and paints, in lead refining, etc. it can also be used to manufacture hydrofluoric acid, another important industrial chemical and intermediate for many other fluorine compounds. It can also be converted to aluminium fluoride and cryolite which are important in the conversion of alumina ores to aluminium metal. Ultimately the fluorosilicic acid byproduct from the phosphate industry could become the Teflon on your frying pan, the refrigerant compound in your refrigerator or incorporated in the many products you use every day. Anyone wanting to follow the debate and/or check back over previous articles in the debate can find the list of articles at Fluoride Debate. This entry was posted in Health and Medicine, New Zealand, politics, SciBlogs, science, Science and Society and tagged Connett, debate, fluoridation, fluoridation debate, fluoride, Perrott, SciBlogs. Bookmark the permalink. Declan Waugh holds only an undergraduate college degree. So, it is somewhat understandable that he fails to understand the importance for accuracy in his claims, and for peer-review of his discredited paper. It is a mystery, however, that someone like Connett, who supposedly holds a PhD in chemistry would circumvent the peer-review process by publishing his opinions on fluoridation in a non peer-reviewed book which cites questionable “references” for his claims, then constantly attempt to pass off this book as “scientific evidence”. Surely somewhere along the line in an MS program and PhD program, he would have been taught the difference between validly referenced science and the type of junk he consistently seeks to put over on the public. Has anyone ever really checked the validity of his credentials? Hmm, that sounds…familiar. Bragging about the pages of references in…a book. Hmm. …would circumvent the peer-review process by publishing his opinions on fluoridation in a non peer-reviewed book which cites questionable “references” for his claims, then constantly attempt to pass off this book as “scientific evidence”. Yep, familiar. I wonder if this happens in other cases? I’m pretty sure it does. Sounds oh so very familiar. The non-scientific popular political view is that humans change climate. Do we have reason for concern about possible human-induced climate change? This book’s 504 pages and over 2,300 references to peer-reviewed scientific literature and other authoritative sources engagingly synthesize what we know about the sun, earth, ice, water, and air. What I don’t get is why people buy that kind of crap when is such a self-evident con job. Some guy with a Phd is peddling a book that (bravely, courageously, righteously, etc) shows how the global scientific community is all wrong, wrong, wrong on topic “X” and the author wants your money. “Are you sciency?” you ask. “Why sure I am” he replies. “I’m super-sciency. Just look at my Phd. Look at my blog”. “Ok, are your arguments sciencey? The excuses given are always predictably the same. Only the labels are different. Steven and Cedric – I am not at all surprised at your comments given that you both display the same closed mind-set of your mentor Ken. I came into this contest puzzled at why the Waikato DHB website refers to the 2000 York Review as being the ultimate in ‘evidence’ that CWF is ‘safe, beneficial and cost effective’ when a Professor with BSc, MSc, DSc and FMedSci after his name is clearly at odds with the claims made for the review. It seems to me the NFIS is failing in its task to provide people like yourselves, the DHBs, local government, dentists, local government and the public with up-to-date, incontrovertible and unarguable material to refute the knockers and wreckers. If the NFIS cannot provide the better, more sophisticated and settled arguments to replace those that Tony Ryall says are not working anymore than it is obvious the NFIS needs replacing. It also indicates that the arguments you present, which I presume are based on similar material supplied to the MoH, Dentists, politicians etc, is also not working any more. That could be why 139 communities in the past 24 months have given CWF the flick instead of a tick! Trevor, did you include our fair city of Hamilton in your 139? It’s you versus the scientific consensus. There’s no wriggling around that. It’s not your conclusions that are important. It seems to me the NFIS is failing in…. So tell us what’s “really” going on. How does the conspiracy work? Trevor…..you, like all uninformed antifluoridationists, assume yourself to be in possession of some “new” and “up-to-date emerging science” that has inexplicably not been made available to the worldwide body of respected healthcare. The actuality however, is that anything of any relevance or significance is only “new” to you. It is not new to any of the legions of respected healthcare personnel who have long since understood the science of water fluoridation and have long since addressed the “information” you deem to be “new”. Your perceived lack of information being provided to the healthcare community is a function of your ignorance of the issue, not that of those of us who actually DO understand the issue and do know what we are talking about. Now, that said, if you have some “new, up-to-date” information which you are concerned has been presented to only antifluoridationists and not to the worldwide scientific and healthcare community, then, by all means, provide it and I will be more than happy to explain it to you. Trevor, the reason may be that the DHB has gone with the current scientific consensus rather than the opinion of a single person?